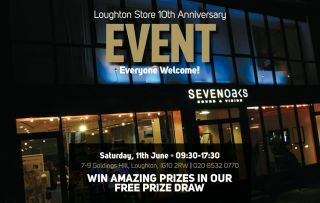 Visit Sevenoaks Loughton’s 10th birthday party this Saturday | What Hi-Fi? Sevenoaks Sound and Vision’s Loughton store has been given one helluva present for its tenth anniversary: a complete makeover, and a special event to mark its double-digit milestone. The event, which takes place on Saturday 11th June, will feature incredible offers on the latest home-entertainment tech, some great prizes, exclusive demonstrations and more. And because it’s a birthday party, you’ll get a goodie-bag to take away. Of course. … and you can demo products from Naim, NAD, Sony, Sonos, Bluesound, Yamaha and more – just collar one of the in-store experts. It’s an open-door event, too – so consider this your invitation, and don’t worry about RSVPing. Just don’t forget to wish the shop a happy birthday, or you’ll hurt its feelings. For more information, visit www.sevenoakssoundandvision.co.uk.